The SMART way to achieve your dreams. How many times have you started a health and fitness related journey, done great for a few weeks then began to drop off? How many times have you looked for the first excuse to stop or cheat? If you say you haven’t then chances are you are kidding yourself. I know I’ve done it plenty of times. We tell ourselves that life gets in the way or my favourite is ‘I don’t have time’. One of the keys to any kind of journey, whether it be health and fitness related or something else, is GOAL SETTING. 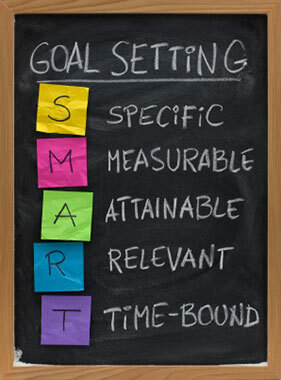 I’m sure most you have heard of the acronym SMART when it comes to goal setting. For those of you that haven’t, get ready to change your perspective on setting your goals. For those that have heard it, stick around and make sure you are still setting your goals this way because chances are you have gone back to setting goals the old way such as ‘I want to lose weight’. Here goes. The S stands for Specific. A specific goal has much more chance of being accomplished than a general goal. For example, ‘I want to do 10,000 steps a day for the next month’ or ‘I want to lose 5kg in the next 8 weeks’. Keeping these nice and specific gives you something real to focus on as opposed to just a broad ‘I want to lose weight’. The M stands for Measurable. Make sure it’s a goal that can be measured. Ask yourself question like ‘How much?’ ‘How many?’ ‘How will I know when it is accomplished?’ If you can measure a goal then you can measure if you need to do more or if you are on track. The A stands for Attainable. When you identify the goals that are most important to you, you can begin to figure out ways in which you can make them a reality. You want to make sure that it is challenging. For example if you say you want to do a Triathlon in a month, this is not attainable, but something like running 5km a day is. The R stands for Realistic. This doesn’t mean set something easy for you to achieve. Don’t confuse the two. Like I stated before, you want your goal to challenge you. The T stands for Time. Make sure your goal has a time frame. Every goal needs an end point to be able to keep you motivated. What sounds more powerful? ‘I want to lose 5kg’ or ‘I want to lose 5kg in 8 weeks’. I think the second one definitely does. Giving your goal a time frame keeps you accountable and helps give you that nudge when day to day life ‘gets in the way’. So, make sure you set yourself a SMART goal so you can succeed and keep motivation high. At Vital Health and Fitness we do what we can to keep you motivated and getting the most out of every session. We also have some other little tricks to keep you going. Contact us to book in your first consult and let’s achieve your SMART goals together!